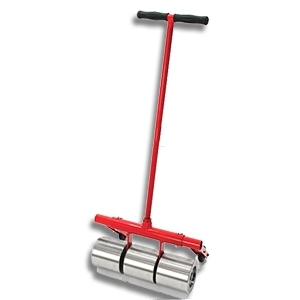 PRODUCT: 100-lb Stand-Up 16-inch Wide Steel Floor / Roof Roller. Used for Vinyl Floors, Roofing Membranes etc. 3 Floating Polished Steel Rollers and Heavy-Duty Contractor Grade Construction. Price/Each. Helps evenly distribute and flatten adhesive build-ups. Assures fully and evenly adhered membranes. Engineered with 3 floating segmented rollers to exert even pressure over surfaces. Constructed of painted solid steel to provide a lifetime of trouble free service. Rollers have smooth surfaces and rounded corners to protect materials from indentations. Equipped with detachable, pivoting wheel base for easy transport, upright support, and protection of segmented rollers. Handle is removable for convenient storage.